Nathaniel Basen is the founder of Pastime, an online sports magazine. Vladimir Guerrero Jr. struts toward home plate, the Buffalo crowd rising to greet him. The opposing pitcher has a dilemma. In each of Guerrero’s first three times at bat, the nineteen-year-old was walked, handed first base to avoid a worse outcome: a home-run, or a double. Now, in the sixth inning, with the Buffalo Bisons down five runs and the bases loaded, the Lehigh Valley pitcher has nowhere to put him. Guerrero reaches the batter’s box, turns his bat upside down, and signs his name in the dirt, complete with a stylistic flourish. It’s Tuesday, July 31, 2018, and the phenom is at his first day of work in Buffalo, the last stop on the minor-league baseball ladder that ends in Toronto. Guerrero, son of now hall of famer Vladimir Guerrero Sr., is, according to virtually everyone who watches these things, the best baseball prospect on earth. He’s an impossibility of a teenager: taller than six feet and more than 200 pounds of tangled muscle. He’s one of the great hitters to ever play minor-league baseball, with an easy swing that springs forward from his powerful back leg. It was built by his father and uncle in the Dominican Republic: up before 6 a.m., hundreds of swings a day. That swing pushed Guerrero Jr. through the minor leagues at a remarkable pace—the average player he’ll face in Buffalo is seven years his senior. Everywhere he’s gone, he’s hit. In Bluefield, West Virginia, Dunedin, Florida, and in Lansing, Michigan. In Manchester, New Hampshire, Guerrero had a batting average over .400, a stat that hadn’t been touched in the major leagues since 1941. The scouting service MLB Pipeline assigned him the highest hitting grade they’ve ever given. Baseball is a sport driven by futility, failure is its connective tissue. It’s a game designed to humble, with success capped cruelly low. So far in his brief professional life, Guerrero has not been humbled. He hasn’t even seemed particularly challenged. So the fans at Coca-Cola Field are ready for their first glimpse. With a two-strike count, the Lehigh pitcher hurls the ball toward home plate. Guerrero triggers his pigeon-toed swing, front knee nearly finding its counterpart before coming toward the mound. His hands come through the zone and bat finds ball. It’s a line drive to left field, almost perfectly placed and hit hard. An outfielder turns and sprints, tracking the ball to his left. He dives toward it, snaring it just before it hits the ground: Guerrero is out, but his flawless swing was on full display. 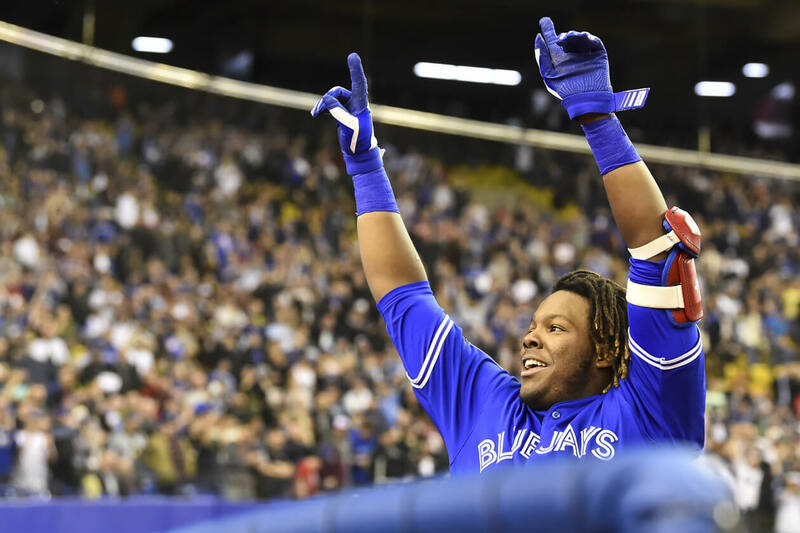 It’s this single, perfected motion that has made Guerrero the centrepiece of an adrenalized group of young athletes, advertised as the faces of a new chapter of Blue Jays baseball: Guerrero, shortstop Bo Bichette, catcher Danny Jansen. But, unlike most baseball teams with a similarly exciting prospect group, the Blue Jays have only recently become bad. Just two years ago, the Jays were in their second consecutive American League championship, with a deeply talented and beloved roster. In the years since, one of the most feared lineups in baseball has imploded spectacularly, through a combination of aging, injury, and mismanagement. If Guerrero is the future, it’s one that must reckon with a lingering past. Tomorrow is a wonderful promise, unless you wish it were yesterday. There’s an awkward truth underlying Guerrero’s ascendance: for him to be what the Blue Jays want him to be—that is, their starting third baseman—they have to deal with the guy currently in the job. In the first inning on opening day of the 2018 Blue Jays season, New York Yankee Gary Sanchez sent a ground ball ten feet inside third base. Josh Donaldson, Toronto’s star third baseman, dove leftward and trapped the ball with familiarly brilliant glove work. He jumped to his feet, right arm already in motion, and flung the ball toward first. Instead of finding its target, though, the throw fell flat, bouncing six metres short. Later, Donaldson would get another chance. He’d field the ball cleanly, but, when the ball left his fingers, it floated lazily toward first base. After the game, Donaldson admitted he’d been hurting “all spring.” Manager John Gibbons, meanwhile, offered unintentionally grim reassurance: “Not a big deal,” he said of Donaldson’s arm. “It’s just dead.” Donaldson struggled through eleven more games before being placed on the disabled list, resurfacing briefly before leaving a game in May with calf tightness. He still hasn’t returned. This string of events is sad in isolation, but it is startlingly so when put into context. Since he became a Blue Jay, before the 2015 season, Josh Donaldson has been uniformly sensational. A late-blooming star traded from Oakland, Blue Jays fans were unsure what they were getting; expectations were tempered by the suspiciously small package sent in return. Almost immediately, Donaldson showed he was more than anyone imagined. He became one of the very best hitters in the world and played daring, courageous defence. With the sides of his head shaved and a dog-tag necklace, he had a lovable dirtbag quality that belied his thoughtful intelligence. In his first year with the team, he was named baseball’s most valuable player, the sport’s greatest honour, and the award felt somehow unworthy of his actual accomplishment. His day-to-day brilliance was surpassed only by his performance when the pressure was greatest. In 2016, with two outs in a tied tenth inning of a playoff game against Texas, Donaldson created his most lasting image: an ill-advised gallop toward home plate, capitalizing on the chaos of a broken play. As the ball reached the catcher, Donaldson’s face-first slide was instantly iconic, his hand finding home with the catcher’s glove empty for the series-clinching win. It encapsulated everything he’d become: fearless, intuitive, unstoppable. Going into the 2017 season, Donaldson was the subject of a glossy magazine profile in which he gave the writer his to-do list: hit fifty home runs, become the best hitter in baseball, and win a World Series in Toronto. At the time, none seemed unreasonable. Just over a year later, this feels remote and distant. Donaldson has played in just thirty-six games, and the Blue Jays are terrible. Tuesday was Guerrero’s debut in Buffalo, but in Toronto, it was the trade deadline. The team sold off assets at an unprecedented rate, culling six players from the major-league roster. None of them, though, were named Josh Donaldson. For now, his injury is scaring interested teams. If healthy, he could be moved through the waiver wire near the end of August. The Jays would like that; they’ve already moved on, with a new third baseman just a two-hour drive away. Nobody wants to be in Triple A. One notch below the big leagues, Triple-A baseball is where the future and past mingle clumsily. On the Bisons, there are athletes, like Guerrero, Jansen, and outfielder Anthony Alford, who hope to be there for precisely as little time as possible—the dream of stardom is just a phone call away. There are others, like pitcher Craig Breslow, who is thirty-seven years old and spent a decade in the majors. A Yale molecular-physics and biochemistry grad, Breslow has been deferring his medical-school acceptance since 2002. He could retire today and slip into a fulfilling and comfortable post-baseball life. Instead, he sits in the Coca-Cola Field bullpen, waiting for one last call to Toronto. There are also those who have gone from future star to has-been without ever finding the climax their career once promised. In 2014, Dalton Pompey was a twenty-one-year-old from Mississauga, called up to the Blue Jays at the tail end of another disappointing season. He played strong outfield defence and hit a home run off ace pitcher Félix Hernández. In spring training the next year, Pompey was set to be the starting centre fielder. But immediate success eluded him, and he was soon sent back down to the minors, where he’s been, more or less, ever since. On Tuesday, as the media hoarded Guerrero’s airspace, it must’ve reminded Pompey of spring in 2015, when everything was imminent. It’s doubtful, now, he’ll ever have the career that once felt inevitable. To enter a Triple-A clubhouse as baseball’s top prospect, then, requires some delicacy. The Bisons already had a third baseman, of course. Jason Leblebijian is dominant enough to be a two-time minor-league all-star but not talented enough to play in Toronto. Before Guerrero came up, Leblebijian was placed suddenly on the disabled list. Pitcher Danny Barnes was told he’d no longer wear number twenty-seven—that was for Guerrero (it’s his dad’s old number). Perhaps anticipating tension, Guerrero brought a gift for his teammates; home-cooked chicken. His abuela Altagracia sent him with containers full of it. She lives with him and cooks for him, just like she did for his father. “If I moved to China,” he joked before the game, with a coach cobbled alongside as his Spanish translator “she’d follow me to China.” With reporters, he was mostly reserved, answering template questions dutifully and occasionally allowing a shy smile. For his teammates, he’s more generous, laughing loudly and playfully chasing them around the infield for a hug. He’s boyishly joyful and boundless, genuinely happy on a baseball diamond. He’s exactly the kind of athlete a fan base can embrace, a promise to distract it from its woeful present. As Toronto sits twenty-six games behind the first-place Red Sox, some are becoming more interested in what’s happening in Buffalo. It’s convenient for Blue Jays management, then, that Guerrero is who he is and happens to play third base. If Donaldson is eventually traded or allowed to leave in free agency, the blow will be softened. This is a familiar pattern in baseball, a sport driven by 150 years of stubborn narrative. There’s something grossly capitalist and distinctly North American about the way the so-called national pastime is sold. We market childhood dreams and idyllic ballpark Sundays, while in the same breath, we scrutinize productivity, potential, and remaining value; the beauty of the sport and the business of it are stitched together for a team owner’s bottom line. We pretend that one feeds the other, but if we were honest, we’d admit they’re incompatible. The economy of sport is always at odds with the purity which drives it, which is especially true in a game so steeped in the American mystique. Like the great wealth generators they are, team executives manage to commodify hope and sell it for profit. In Buffalo, that means lineups for $130 shirts with a teenager’s name on the back. All the while, minor-league ballplayers are promised the American dream, only to learn they’re inexplicably exempt from government-mandated minimum wage and overtime laws. They’re the engine driving a $10 billion machine but often earn below the federal poverty line. On the other end, the aging star learns he is never loved by management like he is by his fans: there’s always someone younger and cheaper to take his place. When Donaldson made himself into an MVP, he also started a clock ticking toward the end of his time in Toronto, a clock that strikes precisely when his economic benefit falls behind his physical talent. Management’s job has become finding ways to cleave unwieldy parts without offending the moral sensibilities of those who fill the stadium. Blue Jays president Mark Shapiro said in 2017 that if he were “running our team without the fans, we probably would have hit reset over a year ago.” So, much like José Bautista before him, Donaldson will continue to lose value, until he is eventually gone. Fans will forget, quicker than they think, because someone new will have taken his place and because we’ve become wired to adopt the calculating mindset of the executive. Shapiro, public-relations training embodied, will walk away cleanly, peddling the one thing we’re always chasing in the growth economy: the future. It feels odd to eulogize Josh Donaldson the Blue Jay. His time here feels both unreasonably short and a year too long. When he leaves—it seems increasingly likely, though not certain, that he will—it will truly, finally signify the death of one of the great teams in the history of Toronto sports; a team that accomplished so much, was capable of so much more, and fell apart too soon. Even if, by some surprise, Donaldson returns to Toronto, it will no longer be his team; the spotlight will be ceded. There are only a handful of ways a baseball career ends, and few of them are unreservedly happy. Most are on display in Buffalo: Breslow, Leblebijian, Pompey. The distance between a feted major-league career and a decade in underpaid obscurity is short and well travelled. Anthony Gose, once a sure star in the Blue Jays outfield, is now in double-A Frisco trying to remake himself as a pitcher. Even those who find their way to the upper echelons, like Donaldson and Bautista, are working toward their own eventual disappointment. A player like Guerrero is so singularly talented it’s unlikely, though not impossible, that he’ll falter. There’s a story that could be written about him and the other young Blue Jays, graduating to Toronto and leading the team to a title. There’s another possibility, though, where, even if Guerrero excels, those around him don’t. The team loses, a lot. A few bad years pass, and suddenly Guerrero is part of trade talks, and he’s shipped off as part of some loosely formulated rebuild. Baseball, particularly professional baseball, has many tools with which to beat the athlete. Before the game on Tuesday, the Bisons held a media scrum outside of the dugout for Guerrero. They opened the field early, too, so kids could come watch him stretch. One reporter asked him what he thought of the other highly rated players he’s seen in the minors. “They’re all good guys,” he said, through his translator. “Our goal is to do special things for the Blue Jays within the next year.” Guerrero’s been told it often enough to know he’s the future. It’s amazing how quickly it becomes the past. Nathaniel Basen is the editor of Pastime. This essay was originally published by Pastime © 2018. All rights reserved. Sign up at readpastime.com.